OCHOR APPEALS TO UKWUANI PDP FAITHFUL TO REMAIN CALM. Peoples Democratic Party (PDP) members in Ukwuani LGA have been called upon to remain faithful to the dreams of the party and the government of Senator Ifeanyi Okowa, Governor of Delta State. The Appeal was made recently in Obiaruku, by the Executive Director, Social Services Development, on the Board of the Delta State Oil Producing Areas Development Commission, DESOPADEC, Hon Ochor Chris Ochor, during the first general meeting of the party with the LGA new EXCO, led by Engr. Patrick Kaine. Hon. 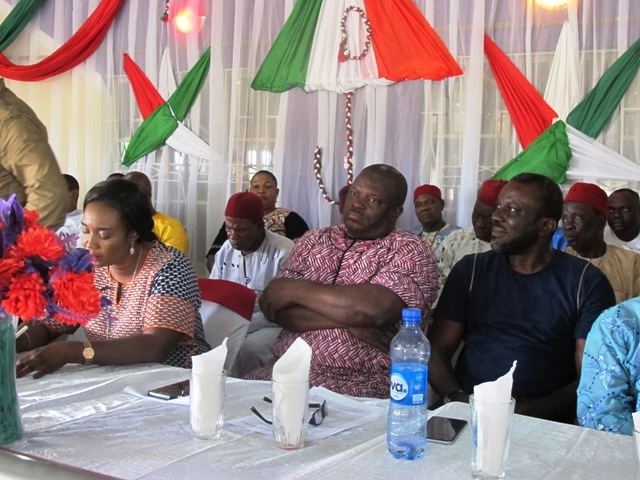 Ochor who spoke against the back drop of expectations by the people for the PDP led government to achieve some of the promised dividends of democracy, within one year, urged the constituents to be patient with the Okowa led government, given the very harsh economy realities facing the state and the country since it assumed office on May 29, 2015. “Patience is what I am asking you for as I know that in a little while, you will start seeing the reasons why you supported the party in the last election, as the governor and his executive are adjusting”, he said. Continuing, Hon Ochor noted that the limitations facing the administration would soon be untied and resolved, even as he affirmed that the party itself was in the process of adjusting re-organizing in order to be better positioned to deliver the expected benefits for the party members. On the recent activities of some party members who had gone to the All Progressive Congress, APC in the LGA, Ochor admonished them for going to register with the opposition and were still attending PDP meetings, describing them as unserious and unfaithful politicians who tomorrow will come back to denounce the party for not helping them and advising such members to retreat and be serious as to where they actually wish to belong. Those who spoke in the same light were Hon Alphonsus Ojo, Chief Fidelis Okenmor Tillije, the LGA Chairman, Barr Mrs Benedicta Osakunih-Izuegbu.